As a little girl, I remember lying in bed early on Saturday mornings. I’d be in that drowsy state where you’re half awake and half asleep. The covers would be so warm and snuggly. The beautiful rays of morning sun would be shining in through my window. Inside the house, I’d hear the sound of the washing machine chugging away, and I’d hear Mom singing as she worked on cleaning the house. Lately, I’ve read several articles and books that have suggested that women should be purposeful in singing songs of praise and worship as they go about their daily chores. These articles and books have pointed out that singing has many benefits that I’d never even thought about. ~Singing songs of praise and worship to God is a wonderful witness to other family members. ~Purposefully singing songs of praise and worship is a wonderful way to brighten your day and raise your spirits. ~When often heard, songs of praise and worship will more readily come to mind in times of worry or trouble. ~Singing songs of praise and worship helps to make even menial jobs, like doing the dishes, a fun and special time to draw closer to the Lord. Who would have thought that something as simple as singing a song could have such a impact in our day to day lives? I don’t know if my Mom was purposeful in her singing, or if that was just a way for her to spend a few minutes of praise and worship with Jesus in the midst of her busy life. Either way, it really made a difference to me. I find myself singing her favorite lines from “Blessed Assurance” when I’m throwing in a load of laundry or doing some dusting. 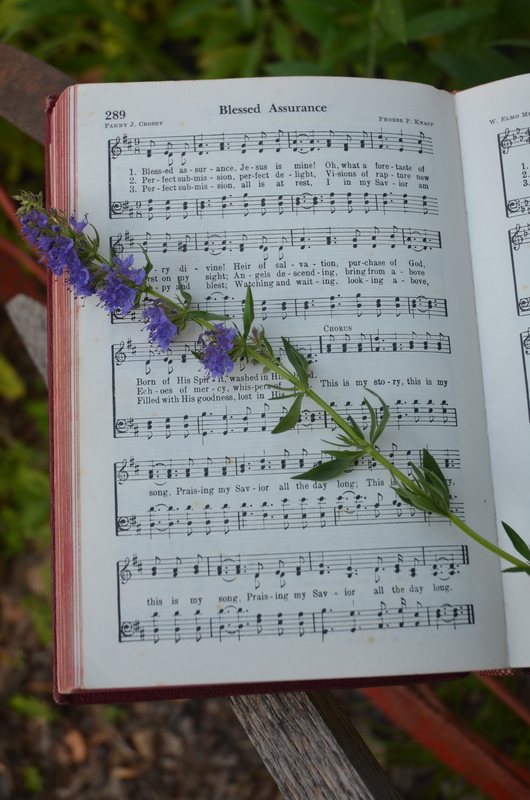 Mom may not have realized it at the time, but her sweet, simple, singing during Saturday morning chores helped to start me on a precious journey with the Lord that will last through eternity. Now that’s something to sing about! Our Jersey milk cows Star and Speck finally had their calves a few weeks ago. Since then, we’ve been enjoying their fresh milk and cream. Last night, we decided to use some of the cream to make some fresh butter. 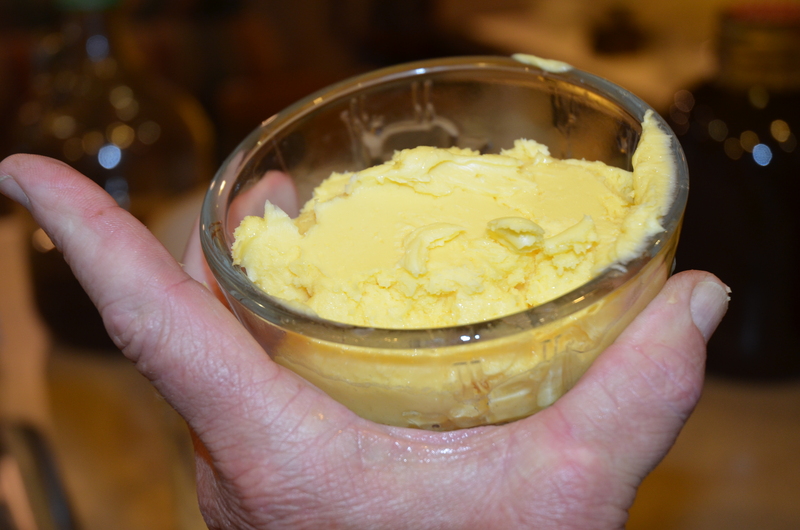 If you’ve never made your own butter, it is easy to do, and tastes delicious! Here’s how we do it. After milking, we strain the milk and put it in the refrigerator overnight. The cream will rise to the top of the milk jar. Using a ladle, we scoop off the cream and put it into the churn. You don’t have to have a churn to make butter. You can use a mixer, or even a simple glass mason jar. (If you use a mason jar, you will have to put a lid on the jar and shake the cream.) 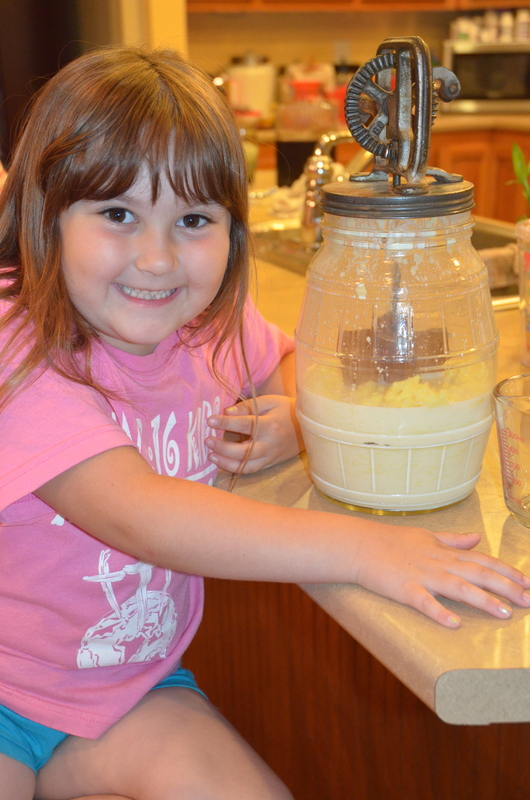 We prefer using a hand churn because it’s what our family has always used. After the cream is in the churn, we let it sit until it gets close to room temperature. The cream turns into butter much faster if it’s a little warmer. It won’t hurt anything if you want to churn it while it’s cold, it just won’t turn into cream until it warms up. When my Dad was a little boy, he liked to turn the handle on the churn so much, that he’d get in some extra turns while the cream was cold, just for the fun of it! After the cream warms up a little, churn away. After a little bit of churning, you’ll notice golden flecks appearing in the milk. That’s the butter! Keep churning, but slow down a little to allow the butter to collect. It’s almost magical to see the large golden clumps appearing in the jar! Butter floating in the churn. After the butter has collected, it’s time to take it out of the churn, separating it from the milk (which is now yummy buttermilk!). We use my Great-Grandma Bessie’s wooden butter paddle to do this, but you can also use a spoon. 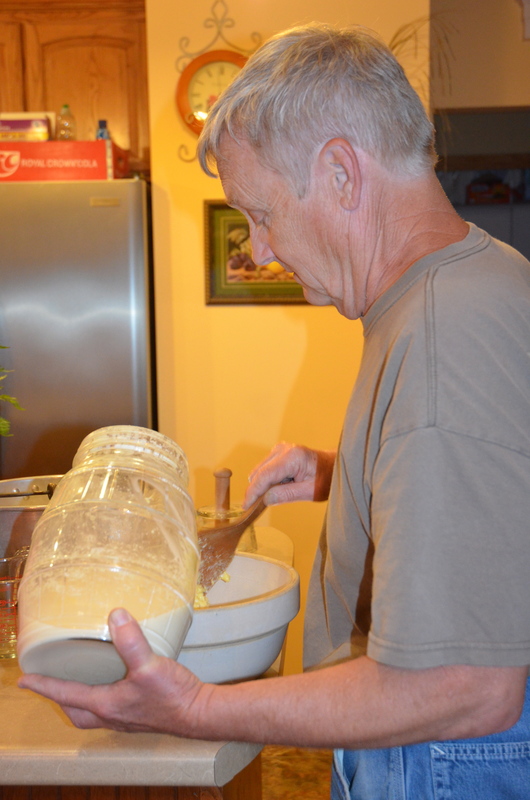 My Dad scooping out the butter from the churn. After we get all the butter out of the churn, we pour the buttermilk into a pitcher and put it in the refrigerator for later use. The next step is to wash the butter. We pour ice water over the butter and work it through the butter using a spoon. At first, the water is a milky color, but after several times of pouring on water, working it through, and draining it off, the water will be almost clear. The cold water will also make your butter much harder. Washing the buttermilk out of the butter helps it to stay fresh longer. We also add a little salt. 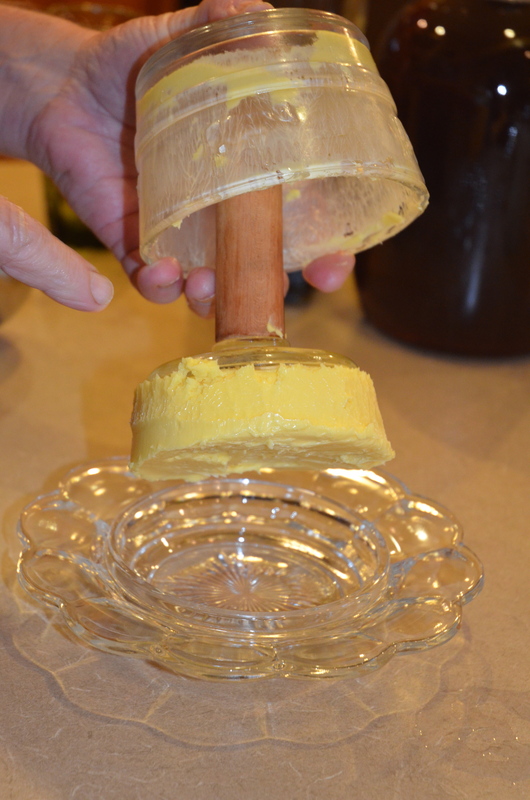 When the butter is clean, the next step is to put it into a butter mold. If you don’t have a butter mold, don’t panic. You can also shape the butter with a spoon. We just happen to have several butter molds that we like to use to make the butter look pretty. The one we’re using in the photo below is a glass mold with pictures of cows. My favorite mold is my Great Grandma Bessie’s wooden mold, which has a lovely picture of ferns on the top. 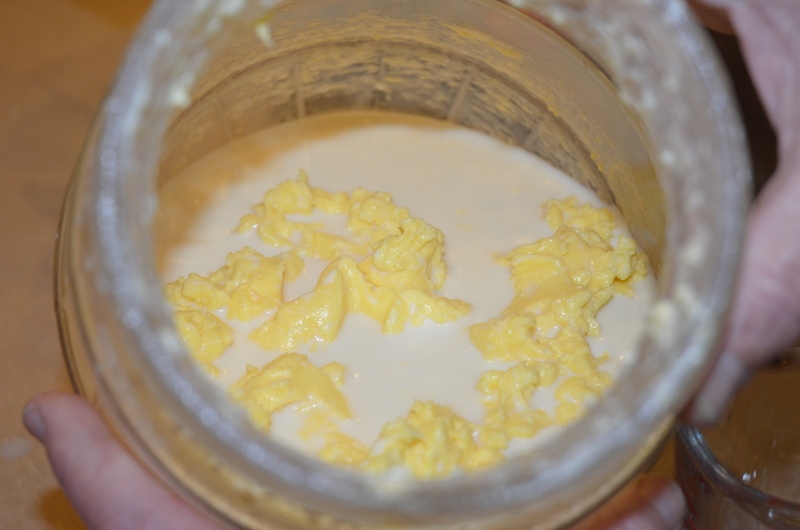 Here is what the butter looks like in the mold before we’ve smoothed down the bottom with a spoon. You have to pack it tightly so it will take the shape of the mold. Once the butter is tightly packed in the mold, we pop it out onto the butter dish. You can also use a plate or waxed paper. In the photo below, we only made enough butter to fill half the mold. Pushing the butter out of the mold. That’s all there is to it. Once the butter is off of the mold, the only steps left are to put the lid on the butter dish, and put it in the refrigerator. Oh yes, there is one more step…eating the delicious fresh butter! This morning at the farm, I’m going to use some of the buttermilk to make some piping hot buttermilk pancakes. Then, we’ll top those with some fresh butter and homemade blueberry syrup that I made with our own blueberries. Yum! Life on the farm is delicious! 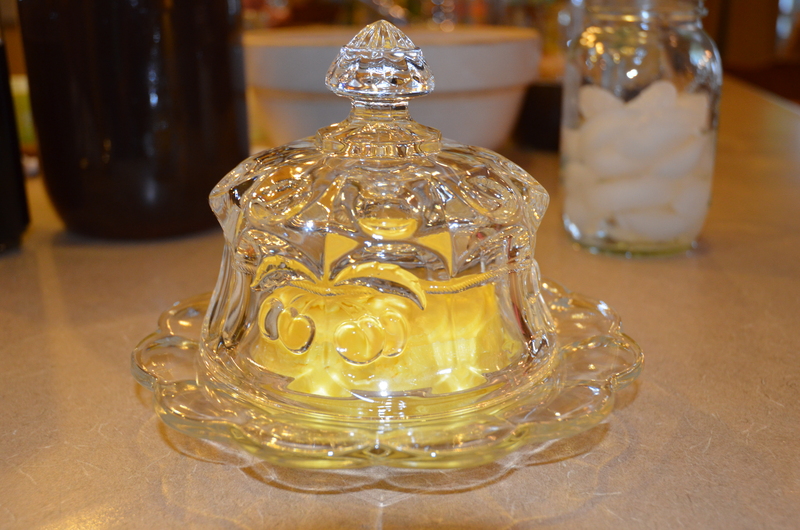 Butter in the butter dish! Disclaimer: If something goes horribly wrong while you are making butter, eating butter, or thinking about making or eating butter, we are not responsible.